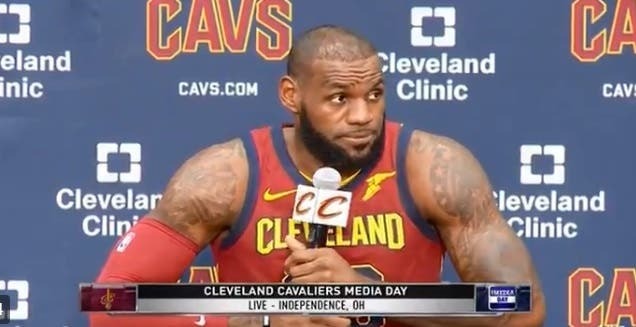 Basketball megastar LeBron James addressed the President’s inflammatory attacks on black athletes who kneel during the national anthem during the NBA’s Media Day, praising former 49ers quarterback Colin Kaepernick for taking a stand against racism and police brutality. “It wasn’t a name call … it was like ‘You bum!’ Me and my friends call each other that all the time. I’m not his friend though. The thing that frustrated me and pissed me off is that he used the sports platform to divide us. Sport and sports is so amazing, what sports can do for everyone, no matter the shape, or size, or race, or ethnicity, or religion — or whatever. People find teams, people find payers, people find colors because of sport and they just gravitate toward that and it makes people so happy. And it brings people together like none other. But James saved his most powerful condemnation for last, calling out the President for failing to rise to the responsibilities of the office and for failing to adequately govern this nation. “He doesn’t understand the power that he has for being the leader of this beautiful country. He doesn’t understand how many kids, no matter the race, look up to the President of the United States for guidance, for leadership, for words of encouragement.